Julia Enthoven is the Cofounder and CEO of Kapwing, a Village Global seed-stage company making creativity simple. Kapwing lets anyone create and edit video online in a matter of minutes, not hours. 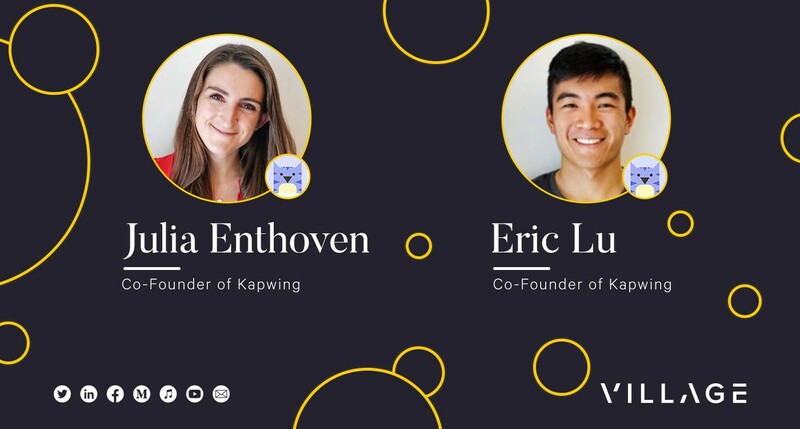 With video production and consumption exploding over the last 5 years, Kapwing’s platform aims to democratize how rich media content is made. 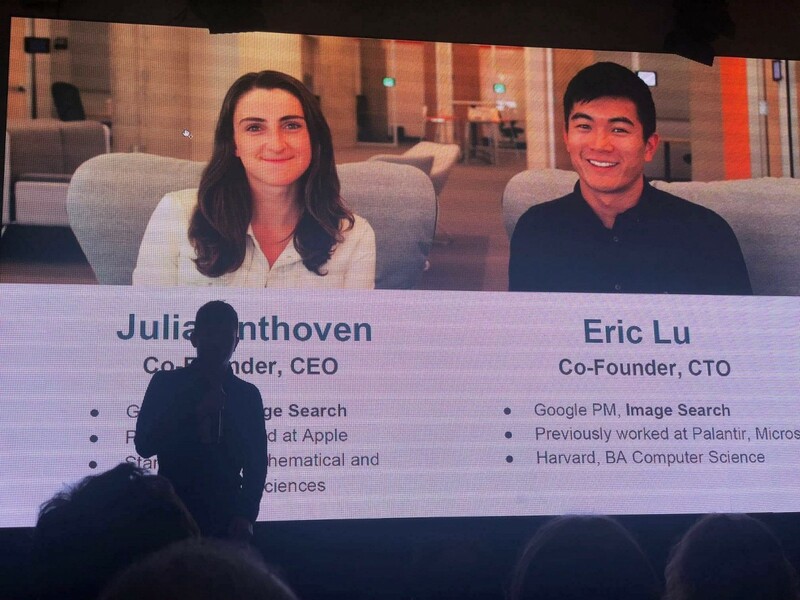 Julia shares her story of uniting with Cofounder and CTO, Eric Lu, a Harvard CS grad who previously worked with Julia at Google. In this post, she shares her thoughts on finding a Cofounder for people considering the tradeoffs of starting a company solo or looking for a partner to scale. 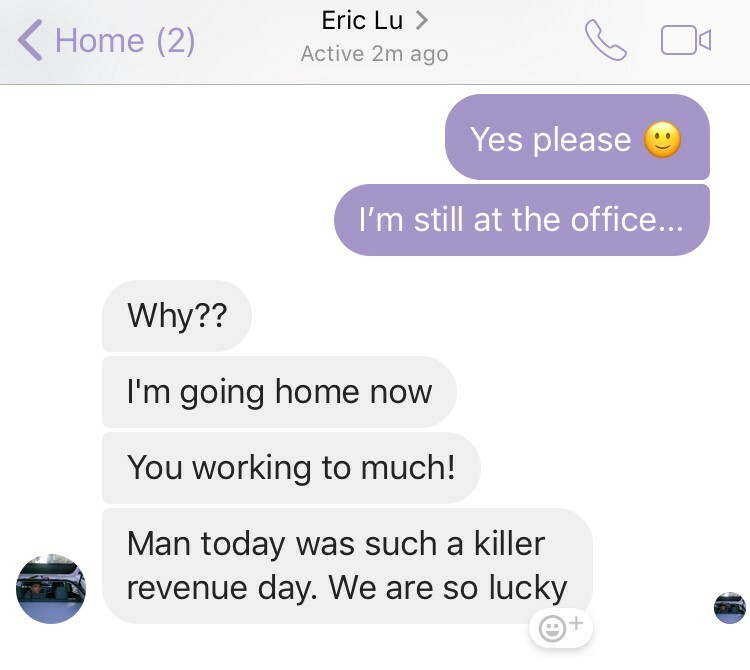 Last July, I left a six-figure salary to work with a friend, Eric Lu, on starting a company. It didn’t work. We had to try out multiple ideas before we found one that stuck. Now that we’re running a thriving startup, Eric and I both know that we wouldn’t have been able to start Kapwing without the other. Eric and I worked together for two years at Google. He left Google before me to try to start something on his own. Eight months and five failed projects later, he was looking for cofounders at the same time that I was looking for new roles inside of Google. When he pitched a short project that we could work on together, I took unpaid leave to test out the waters. Four weeks later, I officially quit. There’s a good reason that so many editorials compare cofounder relationships to marriage. Since leaving Google, I spend more time with Eric than with anyone else by far, including friends and significant others. For a year, it was just the two of us, all day every day, working, coding, strategizing, getting lunch and often breakfast and dinner. We are constantly challenging each other, reassuring, lecturing and learning from each other, debating, and celebrating small wins. Of course, every cofounder relationship has ups and downs. Eric’s not great at brainstorming, and he gets adversarial when he’s uncertain. I’m a worse engineer and designer than him, and I’m sometimes too stubborn and sometimes not decisive enough. We can both be overly critical and impatient. We make mistakes, and we mistakenly blame each other for our own mistakes. In the end, the partnership works because we trust, admire, and appreciate each other no matter what, and that stable gratitude carries us through the bad days. Companionship: There’s an inherent loneliness in the very early days of a startup. No one else knows everything about (or cares about) how Kapwing is doing, but for us it’s always top of mind. Cofounders’ fears and dreams are literally married in that way. When you’re starting a company, you must make decisions without any advice or precedent, and having someone beside you with the same commitment to the company helps you come up with more ideas, make better and faster decisions, and reaffirm your vision. Cofounders support and rely on each other in the face of unexpected obstacles and difficult scenarios that they’re not prepared for. Motivation: When you’re building a product by yourself, no one is pushing you towards the next milestone. It’s the opposite, actually; everyone assures you that you will fail and acts surprised when you grow. With a cofounder, you pledge to move yourself forward in parallel. Cofounders motivate each other make fast, focused progress by expressing intention and holding each other accountable. Speed: Two is just better than one. If you pick a smart partner, you’ll be able to get stuff done faster than you could get it done on your own. You’ll have to figure out how to divide the work, how to make decisions, and how to avoid distraction and bickering, but generally having two brains means twice as much code, emails, traction, and progress. External expectations: It seems that investors prefer cofounders to solo founders. Paul Graham calls “Single founder” the #1 mistake that kills startups. Excellent: Starting a company is hard, so work with someone Great, someone who impresses you and wants to grow a company. Not the people you think are smart, cool, ambitious, or would be fun to work with, but the people who knock your socks off with talent and drive. Your cofounder should be able to adapt, learn quickly, and excel in new circumstances. Puts the company before themselves: Cofounders have to put the business needs in front of their own needs, which requires an enormous level of trust in each other. Ask the tough questions up front: Who will make the final decisions when you disagree? What happens if one of you can’t grow as fast as the company does? What happens if you want to quit, a year from now? Your income, reputation, and success depend on the startup’s success and, consequently, on each other’s performance. You need to find someone who aligns their personal incentives with those of the company. Emotionally supportive in the bad times: At the very beginning, when you’re looking for a cofounder, your ideas seem exciting, perfect, and numerous. But your cofounder must be someone who inspires you when things are not going well. Focus on testing out what happens when the going gets tough. 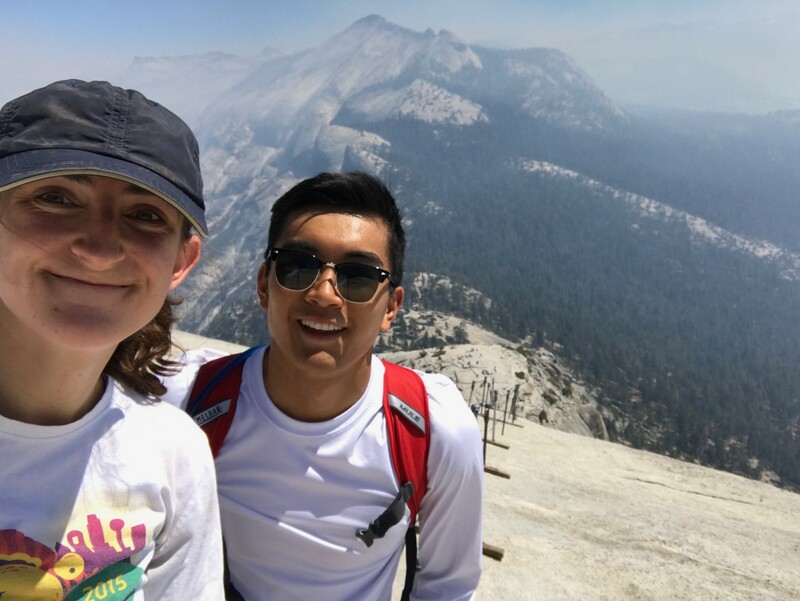 Eric and I both like to hike, so before agreeing to work together we went on a few big hikes. We went through Myers Briggs tests, several different “cofounder” quizzes, and frank discussions about ownership during the long walks and drives. Meet great people. Eric and I got lucky. 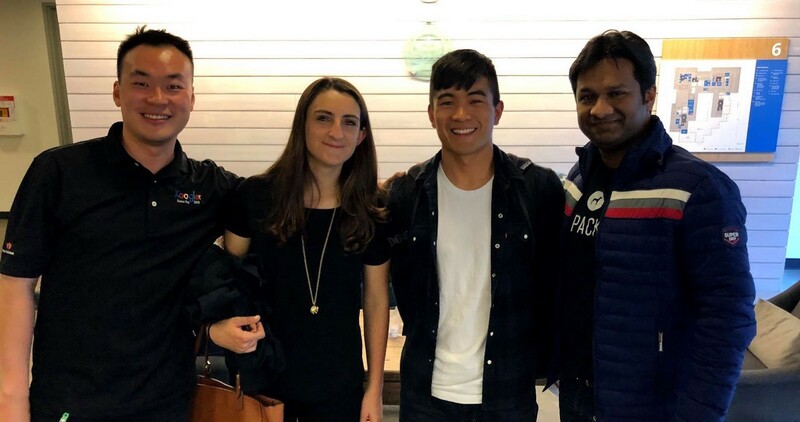 We met in Google’s Associate Product Manager program when we were randomly assigned to the same first team. We worked on overlapping projects and participated in the APM’s social events, so we got to see each other’s work, habits, and personalities. Takeaway: If you want to meet a cofounder, put yourself into both social and professional settings (classes, clubs, jobs, etc) where you’re meeting new talented people. Give them a pitch: In May, when I was considering new roles inside Google and outside of other companies, Eric asked me to take unpaid leave from Google while we build a small website together. The idea (which became Normal Software) was not a startup and wouldn’t make money, but it would allow us to try out working together before either of us committed. With a concrete, low stakes proposal, I felt comfortable giving it a shot. Four weeks later, I was much more confident about leaving Google to work with Eric full time. Takeaway: If you meet someone that you would like to work with, come up with an achievable milestone you can work on before the person leaves their full-time job and pitch it to them. Giving a potential cofounder a project to do is like giving them an ultimatum since you can gauge their interest and commitment to the startup hustle. It also gives them a concrete next step to test the waters. Get to know them through a “starter” project: Normal Software was a great starter project for Eric and I because it included several parts of building an internet company: engineering, some content creation, cold outreach, a launch. It was an intentional experiment to see how we collaborated with each other. Takeaway: To test out the waters, come up with a starter project that has several aspects of starting a company. Your cofounder must be someone who inspires you when things are not going well, and a starter project is a great way to see what happens when the going gets tough. It doesn’t have to be related to the company you actually want to start (maybe better that it isn’t, so that you don’t have to worry about competitive overlap or IP if you decide not to work together). Figure out timing: I took a three-week vacation after quitting Google, but we had a plan for working together full-time. Since we were both committed to a “start date,” Eric made progress on his own for a few weeks while I was out. Takeaway: If you find someone great, it’s worth waiting for them. They might need time to quit their job. You can still make progress in the meantime, as long as you have a plan for when you’ll both be working on it full-time. Commit to each other, not the idea: For the first two and a half months of us working together, Eric and I worked on a different idea — Hot Barber. I liked the Hot Barber concept, but we realized over time that it would be difficult for us to monetize and grow, and since we were bootstrapping we wouldn’t be able to sustain ourselves without cash. Because we were committed to each other rather than the Hot Barber idea, we were able to kill the site and pivot to a new idea. We learned a lot from Hot Barber that we couldn’t have learned any other way but to try, and those learnings made us better entrepreneurs. Takeaway: When you’re trying to get an idea off the ground, make sure you and your cofounder are committed to founding a sustainable business instead of committed to one particular business idea. In Startup Land, you’ll learn a lot and find that your original ideas don’t work. Your founding team must have to have the resilience to experiment, recognize failure, and move on. Time box your self doubt: After leaving Google, Eric and I set a deadline before which we would definitely not find another job. We set this deadline together based on our expectations, aspirations, and financial runway. Before that deadline, we both had other offers on the table, but we turned them down or deferred them. Having a transparent date gave us the space to explore startup ideas without the distraction or anxiety of opportunity cost. It also gave us a definite milestone to race towards; for a long time, Eric told peers that his primary goal was “to convince Julia that she shouldn’t go back to work before January.” He did. Takeaway: Mutually agree on a date where you will both be fully committed to the startup and to working with each other. This time box can help avoid cofounder conflict and self-doubt. Here’s something few people know: Eric actually built the first version of Kapwing when he was working by himself. But he was uncertain about the mission, afraid the product would fail, and not sure how to grow it or make money, so he shut it down and moved on to something else. Months later, it took both of our creativity, vision, and support to resurrect Kapwing and make it a company. The idea itself was insufficent. At an event I attended recently, another founder compared starting a company to the scene in the fourth Harry Potter when Harry enters the labyrinth of the Triwizard Tournament. Everyone is cheering him on as the hedges close, until suddenly it’s silent and he’s completely alone to face uncertain challenges ahead. If you know exactly where to go, maybe it’s easy to run the maze by yourself. But, for the those of us who are as clueless and hopeful as Harry, having someone by your side makes you faster, braver, and more likely to reach the prize at the end. That’s why my first advice to any aspiring entrepreneur is to find a cofounder. Finding the idea seems like the most important issue, but finding a cofounder makes the process of looking for an idea easier, more fun, and more likely to succeed. Your mental sanity will benefit. Thanks for reading! I hope this article helps other developers and entrepreneurs in the early days of starting a company. As always, please reach out to me over email or Twitter with comments, questions, or ideas. Happy cofounder dating! P.s. Is it cofounder or co-founder? Nobody knows! You can connect with Julia on Twitter and LinkedIn. Learn more about Kapwing here.